Your dog loves you and your home, but sometimes, much like a young adult, they just need their own personal space that comes in the form of a dog house. 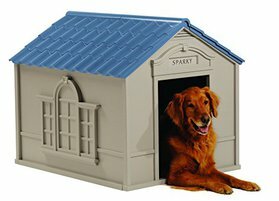 If you have a larger breed dog like St. Bernard or any type of mastiff this presents a particular challenge as average dog house isn’t going to cut it. Choosing a dog house is more than just aesthetics and price, and the data shows that. The pet product industry is big – very big. Annually, as of 2015, the American Pet Products Association reported its value at over $60 billion which means people are spending tons of money on their dogs, what they eat, and where they sleep. A normal crate or washable mat will work for short term issues like housebreaking or discipline, but won’t serve as a long term solution even though everyone thinks it will. Upset canines will often cry or moan throughout the night if left in their cages which should be enough for you to consider custom or pre-built dog houses that are more comfortable and suitable. You’ve spent tons of time and money on everything from collars to chew toys and of course the right type of food – don’t skimp on your dog’s nightly home. 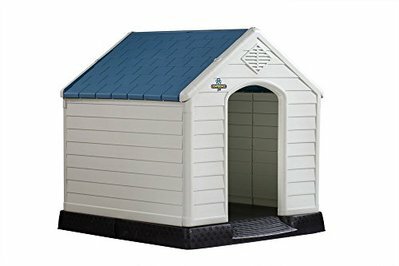 Obviously the big issues (pardon the pun) with choosing a dog house for a larger breed is exactly how big is big enough. The ideal size is one that allows your dog to turn around comfortably but not too big that a draft makes them cold or uncomfortable. Also if you have a dog bed, make sure it’s appropriately fitted to the interior and can be removed without problems and be cleaned. Failure to routinely disinfect a loose-fill dog bed for example can lead to the growth of fleas and other pests which can make your dog uncomfortable. While you can buy a pre-fabricated dog house or indulge in building your own over a weekend, understanding the different material options and what’s best for your dog’s comfort is definitely something you won’t want to ignore. Ideally, you’ll want to avoid the large plastic style dog houses as the plastic retains heat way more than wood and can cause the interior to become very hot in the spring and summer months. Keep in mind that your larger breed mastiff already has a big coat to keep itself warm and any extra heat can become quite uncomfortable. Wood dog houses are also more resistant to the effects of the elements, and can be easier to clean if your dog has an accident or a mishap. On the downside, they can take quite a bit of time to assemble and need to be put together where it will sit as they can be quite cumbersome and weigh upwards of 100 pounds. This can be annoying, but it is still a better option than a flimsy plastic dog house that won’t be the most hospitable for your dog, especially during those muggy summer days. Plastic construction, while not ideal does have its advantages. It is relatively inexpensive compared to wood, easier to move around, and much less of a pain to put together. You can usually just snap them together in a few steps whereas it would be a more committed process with a larger wood unit. If your dog isn’t sleeping on your bed or in a crate, you’ll want to make sure the accommodations you choose for them are suitable year round. Assuming your dog house is outside, perhaps in your backyard, look for features such as a proper overhang or space on the front so it provides shade and a means for rainwater to be funneled away. Additional space is also great as it allows room for a large dish of water or food which larger breeds need to stay hydrated constantly. The inside should be kept dry at all times, not only for the comfort of your pet but also to prevent the growth of mold or fungus which thrives in dark and moist environments. Raised flooring is also a feature you should consider making a priority when looking at potential options. This allows air flow to remain uninterrupted and assist in keeping the area cool and dry. It also does a good job of preventing pests, fleas, and other bacterial infections from getting into the bedding and interior of the structure. Some dog houses even come with optional wheels (usually they can be detached) which can be used to move the unit easier, and adjust how high above the ground it sits. Water resistant sealant is also a feature you should not overlook, especially if you live in an area of the country with heavy precipitation. The exterior of your dog house will likely take a beating and the wood or other material should be properly treated with a sealant that prevents precipitation from leaking into the interior. High-quality dog houses will be treated with a non-toxic water resistant sealant that is more importantly safe for your dog to be around each night. Before you commit to a certain type of style of dog house, consider checking online for reviews from owners of similar breeds to your own. Of course individual dogs have their own preferences, but in general, larger dogs with similar coats and ingrained habits prefer a certain space for napping and sleeping. Ideally, your dog will have this for years to come, so it’s best to see it as an investment rather than an impulsive one-off purchase. The Confidence Pet XL Waterproof Plastic Dog House is a solid entry level dog house that is easy to assemble and easy to clean. The elevated floor keeps your dog’s new home from flooding and the ample room and tall entrance make it great for tall dogs. Don’t let the “vents” on the front and back fool you, though. They are not functional. This dog house isn’t insulated either. It can withstand light to moderate wind and rain but don’t expect your pooch to weather a blizzard in it. If your dog tall enough for you to pet him without bending over, the Confidence Pet XL dog house is a good choice. As long as you live in an area with temperate weather and/or bring your pup inside during the winter, you shouldn’t have a problem with the lack of insulation. As far as dog houses go, this is one of the better looking ones. And it performs pretty well too. The Ware is elevated on adjustable feet so your pooch can have a level place to sleep off the ground. The entrance is a pretty generous size so if your dog is of the larger breed or just really likes Beggin Strips, getting in and out shouldn’t be a problem. The real shingles are a nice touch and if you live in an area with fairly mild weather, it’ll probably last a long time. This is a very good option if you’ve always wanted a log cabin but could never get it past your HOA. The spacious entrance and raised floor make this a great choice for older dogs who might have trouble bending or getting up and down. Though it may look like a chicken coop, the Trixie Dog Club House is actually a pretty great wood dog house. The offset door actually helps keeps your dog more protected from the elements and helps trap in heat during the cold months. The panels are stainable and paintable so if you don’t like the color, it’s pretty easy to change it. The best feature of the Trixie is that the roof is hinged with locking arms, which makes cleanup a breeze. While there’s plenty of room inside, the floor is not the sturdiest. If you’re a “handy” man/woman, you might want to reinforce the floor panels with cross beams or support posts. The hinged roof is the real breakout feature for the Trixie Dog Club House. Even the plastic dog houses that you can simply spray out with a hose aren’t this easy to clean. Forget ever having to crawl into your dog’s house to retrieve a toy or a pup who doesn’t want a bath. 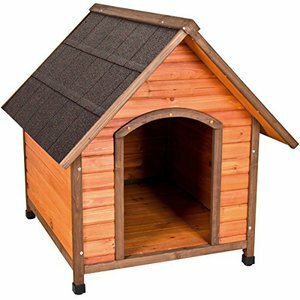 Update: After doing more research and getting some advice from readers, we’ve found a better alternative to the Trixie Dog Club House, the Petsfit 45.6 x 30.9 x 32.1 Wooden Dog House. The Petsfit’s arms are pneumatic so no need to lock them and the floor is reinforced. It’s is constructed from cedar, which repels fleas, and it comes in a gray and white color scheme. The Suncast DH350 is one of the best plastic dog houses we’ve seen. Even though it’s plastic, it’s actually pretty sturdy. 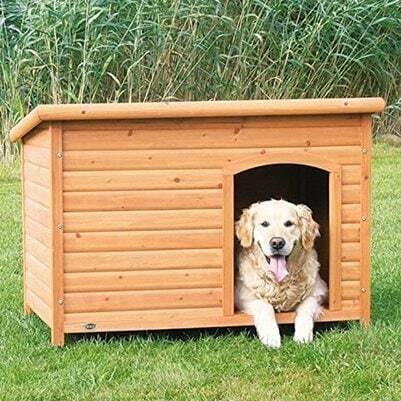 And it’s also the least expensive dog house on our list. Plus it comes with a free door flap to help with insulation. And the set up is a breeze. It took us less than 15 minutes to snap it all together (don’t forget to assemble it outside or it won’t fit through the door). Since the base only has a little lip to keep the water out, you might want to put it on a pallet to raise it off the ground. This will also help with keeping it cool in the summer. As long as the floor is fully supported, we don’t think you need to be overly concerned about the weight limit. Just make sure your dog can fit comfortably since the entrance is rather short. The DH350 has some nice touches like the faux windows, included door flap, and name plate (with included letter stickers!) above the door. If you’re on a tight budget and your dog can comfortably fit through the door, we’d recommend giving the Suncast DH350 a shot. The Duplex wood dog house is the largest one on our list. It’s so big, it can easily fit two large dogs or one extra large dog and a couple of Chihuahuas. There’s a removable partition in the middle so each dog can have their own space or, if your pooches love being next to each other, you can leave the partition out and have one giant canine crash pad. The wood panels don’t seem to be sealed so you may want to do that yourself. You can also stain or paint it to match your own home. Think of it as your pool house. The construction of the Duplex leaves a bit to be desired but there aren’t many dog houses this spacious so if your pup is large enough for your kids to ride, you don’t have a lot of options. There aren’t a lot of dog houses that can fit a Great Dane or Newfoundland sized dog, and out of them all, this is one of the better choices. You’re going to have to put a bit of elbow grease in as far as sealing the wood and reinforcing the floor but this is a solid option for you XXL dog owners.